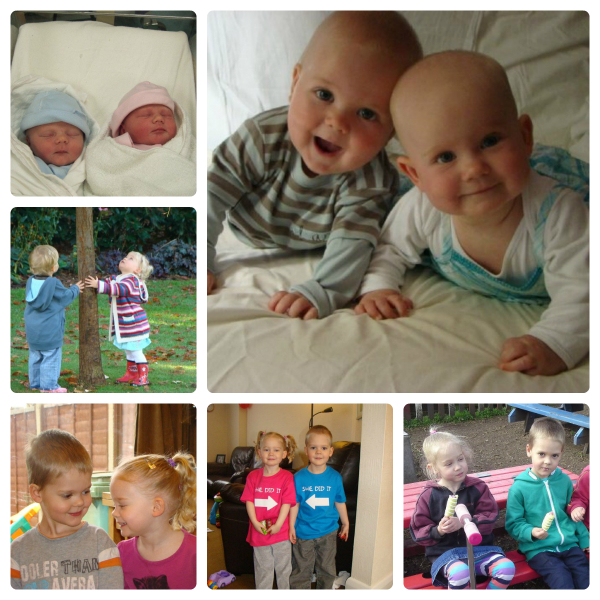 Today marks the start of Twins, Triplets & More Awareness Week 2013. To join in the celebrations I thought I’d share some fun and interesting facts about twins. Of every 1,000 women who gave birth in 2011, 16.1 women had more than one baby. In 1976 that number was 9.6 woman out of every 1000. Chances of having a twin pregnancy is increased by maternal age (30+). Fraternal twining (non-identical) is genetically predisposed and the result of a woman releasing more than one egg at the same time. Identical twins are the result of a random split of a single egg and cannot be genetically predisposed. Male twins will not have twins unless their wives have the ability to produce two eggs. Identical twins share the same DNA but do not have the same fingerprints. 22 % percent of twins are left handed, compared to 10% in singletons. Vanishing twin syndrome- 15-20% percent of all twin pregnancies will miscarry one foetus. Some estimates suggest 1 in 8 people started life as a twin while 1 in 70 actually are a twin. Once you have fraternal twins, you are 3 to 4 times more likely to have another set! Nigeria has the highest rate of multiple births and more identical twins. China has the lowest rate for multiple births averaging 1 in 300. The average birth weight for a twin is 5lbs, 5 oz. By the way, I was not quite 30 when I has mine. Twins do not run in my family. They were born at 38 weeks and weighed 5lbs 12ozs (Jasmine) and 5lbs 14ozs (Thomas). I then went on to have a singleton. Great post! I am going to share that on my FB page. I have twins and I didn’t even know there was an awareness week! I think it might just be in the UK, but it is World Twins Day tomorrow as well (3rd July)! Oh ps. I was 32 when I had mine and I was induced at 38+4 (they don’t let you go past 39 here). 7.5lbs and 6lbs. Cheers!